The Capilano Flute Choir is a fun-loving group of about twenty adult amateur flutists. We meet on alternate Sunday evenings and present several concerts each year at elder care facilities and community events. The ensemble makes use of the whole flute family--piccolo, C flute, alto flute and bass flute. Brenda has been the Music Director and Conductor since 1993. Membership is by audition. 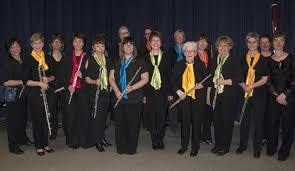 You can also view The Capilano Flute Choir website here. To request more information about auditions, upcoming concert events or to support or book the Capilano Flute Choir please use this contact form.